Many of those around me and my work might have been aware that there was a management shakeup this week at my office. I won’t go into specifics because I believe, as do many around me, that gossip is petty. I will say that my newspaper has undergone some extraordinary and welcome changes in the last few days, including a redesign. I can’t speak for anyone else, but I am feeling more appreciated and more optimistic, and therefore more motivated to excel in my work, than I have been for some time. 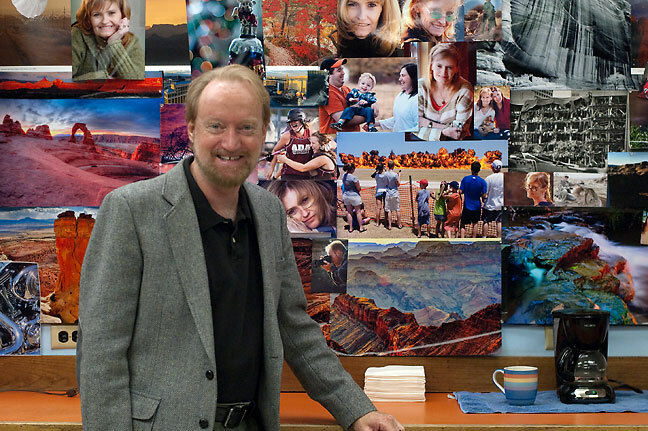 Robert made this image of me in front of the big cork board full of my photos at my office. At one point last week, I was considering taking them all down, packing them up and carting them home, but recent developments have brightened my outlook. Richard – You are an incredibly talented artist. You have an ability to make mundane subjects interesting; and interesting subjects even all-the-more interesting. I maintain you’re one of the best action photographers around — worthy of SI credentials! The Ada (Evening) News, for whatever reason, has a history of outstanding photographers — I recall J. Don Cook and Michael Pope as your predecessors. Both very talented with the lense, but you go down in my book as the best ever at The Ada News and all of Oklahoma! Thanks for all you’ve done to liven up our community. Glad you’re staying put! The Ada News is very fortunate to have you. Sí, Richard, todos estamos muy, muy, muy feliz! I’m glad you’re positive about the changes. I hope things continue to go well. I’m overjoyed about your brighter outlook.